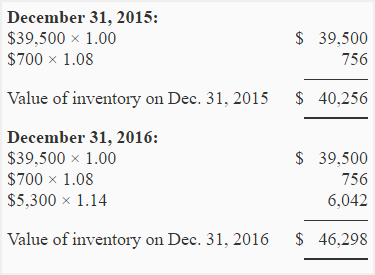 Required: Compute the value of inventory on December 31, 2015 and December 31, 2016 using dollar-value LIFO method. I was able to understand your problem solutions quicker than other sources. Thank you. Thank you for the exercise, they help me to understand FIFO,LIFO methods. May you give us more exercises. Thank you once again! Where to leave a comment for the organization ?